Note: I started this post last Wednesday morning (1/25), but Blogger was acting up and I lost most of my text that I'd spent a half-hour writing. So instead of throwing my computer out the window in frustration, I walked away intending to finish it when I returned, but well, my week kind of got away from me. So just pretend it's last Wednesday, ok? haha! It's appropriate to show you my Twitterpated Gift Set that I made for my Secret Sister at leadership today. 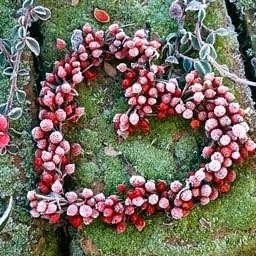 Because I'm a little Twitterpated this morning! 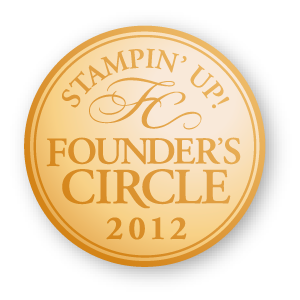 I woke up to discover that my Stampin' Fools put me over the top last night for earning the Hilton Head trip! Isn't that a great way to wake up?? Next stop - Fiji!! WooHoo!! Now, let me show you the gift set, ok? We had optional Secret Sisters at Leadership in my upline, Jan Wakeland's RemARKable Dreambuilders group. We had a list of things to create for our sister based on their likes. This bag and box are just part of what I made for her. 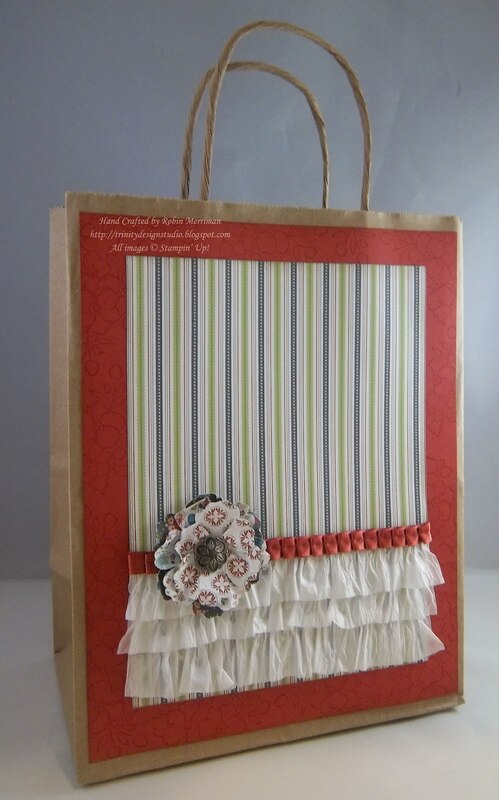 The bag is a simple kraft cubby bag that I decorated. I first attached a piece of Riding Hood Red cardstock that I'd stamped all over with the floral spray from the Bordering on Romance stamp set. Next, I adhered a piece of Twitterpated Designer Series Paper to it. 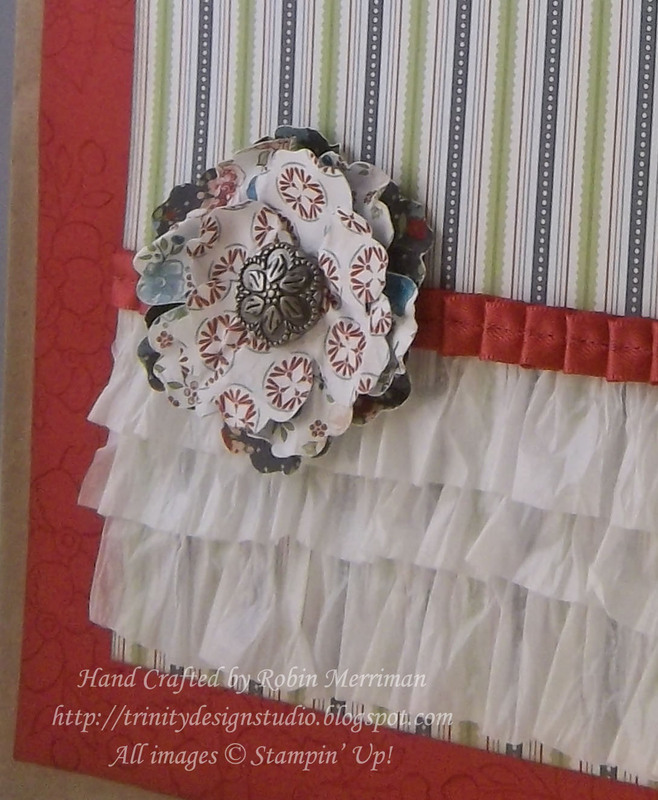 I chose the stripes as a contrast to the florals and waffle paper ruffles. The Whisper White Waffle paper was cut into 1" strips and adhered with SNAIL adhesive to the bag front. I simply hand pleated it along the adhesive. I cut a length of Riding Hood Red Pleated Satin Ribbon to cover the top edge and wrapped it around the Designer Paper, hiding the edges. It's attached with Mini Glue Dots. The flowers were punched out using the new Blossom Punch from the Occasions Mini. I punched them out of different designs of the Twitterpated Designer Paper then sprayed them with a little Stampin' Mist to wet them. I scrunched them all up in a ball to dry, then smoothed them out a bit and added the Antique Brad to the center of the flower. 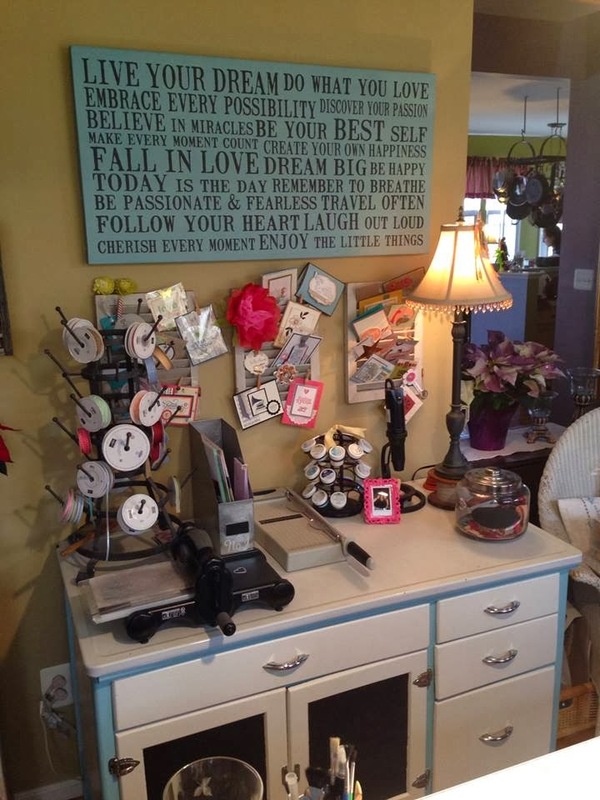 It was attached over the ribbon with Stampin' Dimensionals. Here's a close up of the Kraft Box. 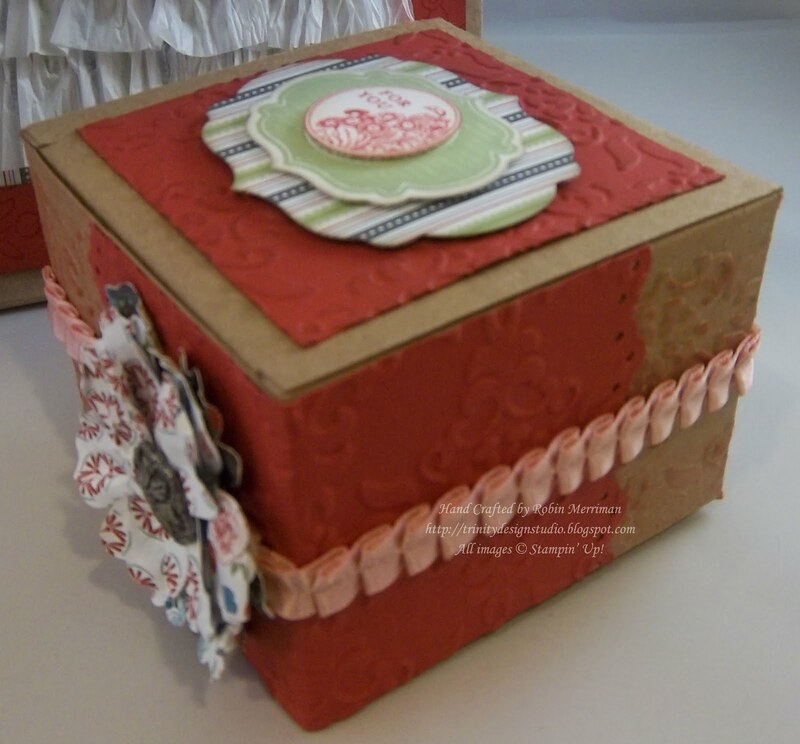 I actually opened up the seam of the box and used my Vintage Wallpaper Textured Embossing Folder to emboss the sides of the box. I sponged it all over with Riding Hood Red ink to make the embossing stand out. Because of the size restrictions of the box in the machine, it left a blank corner, so I took a piece of Riding Hood Red cardstock and embossed it to use in covering the blank corner. I punched the edges with my Eyelet Lace Border Punch before adhering it with Tombow Adhesive. I added a piece of Blushing Bride Pleated Satin Ribbon around the belly of the box and added another paper flower to cover the seam. The design on the top of the box was a piece of Riding Hood Red cardstock, again embossed with the Vintage Wallpaper folder and sponged a bit with matching ink. I cut a piece of DSP with one of the Framelits Labels Dies and stamped an image from the Apothecary Art stamp set in Pear Pizazz ink before using another Labels Die to cut it out. I cleaned the stamp and inked it again in Riding Hood Red, stamped on a scrap of Whisper White and punched it out with the 1" Circle Punch. 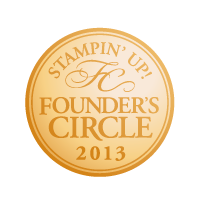 All pieces were sponged with Crumb Cake ink and then popped up on Stampin' Dimensionals. My secret sister was Kathy Hamrick - who gave me some super cute things AND chocolate too! I hope she liked her gift set. There were some project inside it as well, I'll show you those later this week. 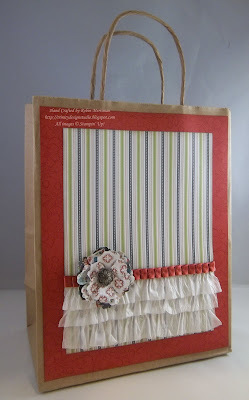 As always, you can order all the supplies (except the bag) from my Online Stampin' Store. And remember, Sale-A-Bration is in full swing, so that means for each $50 in merchandise you purchase, you get a FREE product from the exclusive Sale-A-Bration Brochure! LOVE FREE stuff! Love this! She is a lucky girl! Oh my gosh, that bag and box are beautiful. 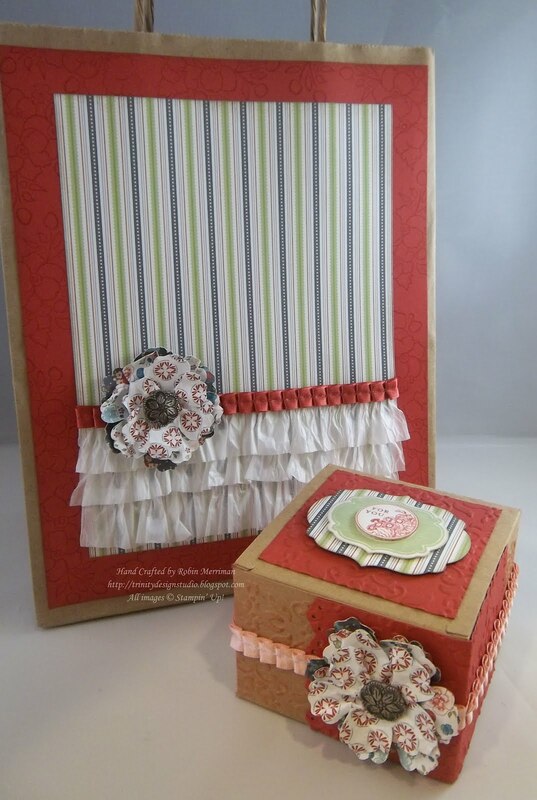 The ruffles on that bag are fabulous, love the embossing on your box! Your partners must have been thrilled. I just love this!! That bag is too stinkin' cute with that waffle paper and that box is jaw dropping!! 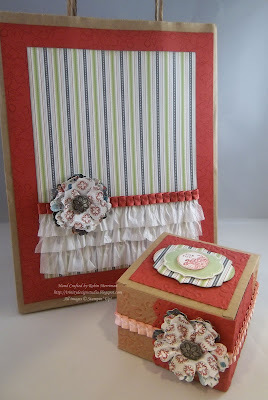 I will be featuring this ensemble on My Crafty Picks #51 with a link back to your blog on 2-5-12. Make sure to stop by to check out all the picks and to pick up your blog badge to display on your blog for being featured!! Wow! 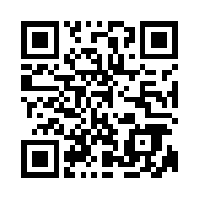 this is a very nice project Robin! 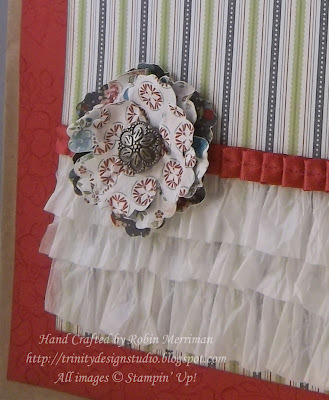 I have not seen the waffle paper used in a project before, very cool the way the ruffles look like real fabric! I'm sure your friend will love this! BTW: I enjoyed all of your pictures and reports from Leadership. These are wonderful!!! Love how you ruffled the waffle paper and those flowers are so beautiful.